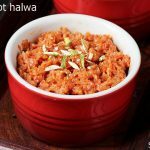 Carrot halwa or gajar halwa recipe – A slow cooked traditional Indian halwa or pudding made by simmering carrots in milk. 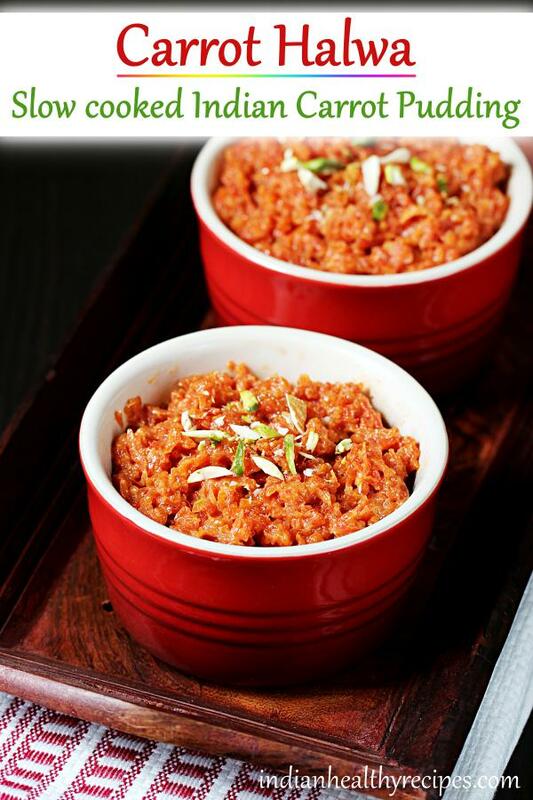 Carrot halwa is popularly known as gajar ka halwa, gajrela or gajar halwa. It makes its presence in most special occasions like festivals, celebrations and parties. Carrot halwa is one of the classic Indian sweets that would not fail to impress anyone. 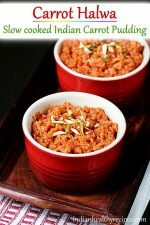 Most Indian households make this gajar halwa during the winters as carrots are in full season. In north India it is made with Delhi gajar. In many other parts of India, Delhi gajar is not available so it is made with regular carrots. Here in Singapore we do get the fresh Delhi gajar in few Indian stores during the season. Whenever I find them I never fail to buy as they are much more flavorful than the regular ones. Gulab jamun, Jalebi, Rasgulla & Kaju katli are some of the popular Sweets from Indian cuisine. Carrot halwa is a Indian pudding made with fresh carrots, milk, sugar, ghee & nuts. It is made by simmering grated carrots in full fat milk & then sweetened with sugar. 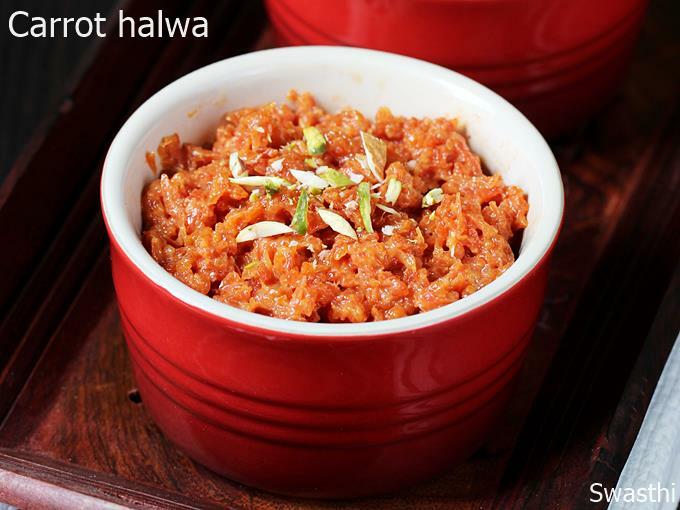 Carrot halwa is flavored with cardamom powder & garnished with chopped nuts. 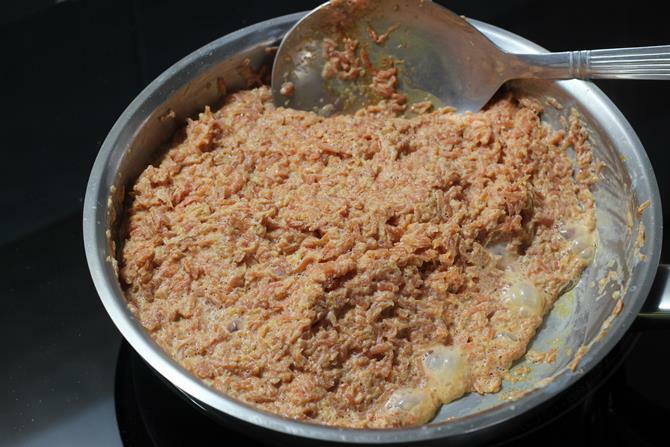 Traditionally carrot halwa was made only with full fat milk and no processed ingredients like condensed milk, evaporated milk or khoya was used. There are 3 different ways of making carrot halwa. I have shared all the method in this post. Traditional method using whole milk. I have shared this method in the step by step photos & recipe card. A rich version using khoya. I follow this method during festive season when I have some surplus khoya left & prefer to use up. 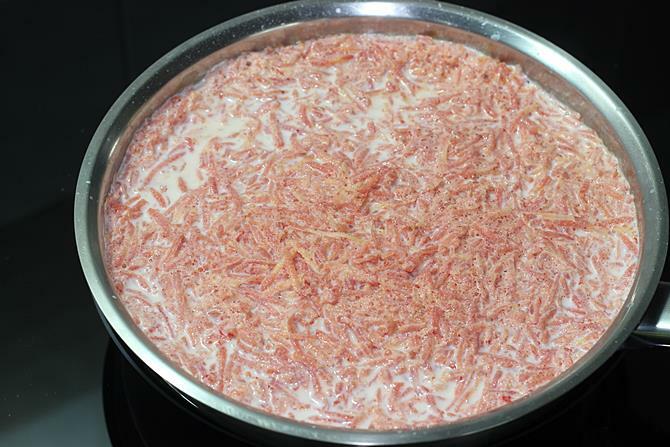 This method reduce the cook time by 50% since the amount of milk used is less. I have shared this in the recipe card as method 2. Carrot halwa using condensed milk – For detailed post you can check this gajar ka halwa using condensed milk. However I have also included this method in the notes. This method takes just about 15 mins. Choice of carrots: Always use fresh, tender and young carrots that are less fibrous. If needed taste them before cooking. Carrots that are too old or mature are more fibrous & have a different flavour & texture which do not go well for the halwa. Young carrots are sweeter in flavour & yield a mouth melting carrot halwa. If you cannot find delhi gajar you can use the regular carrots. 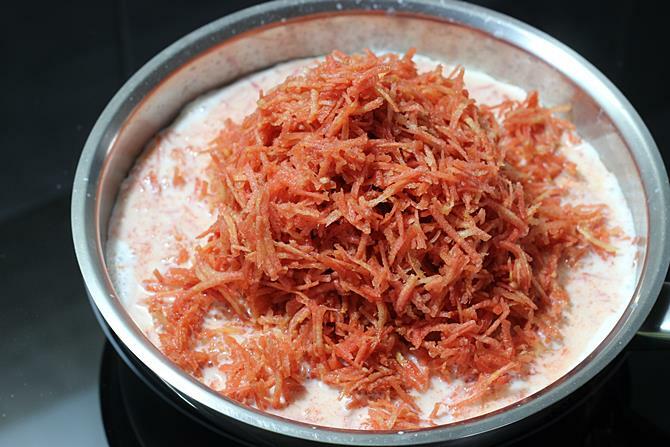 Milk: Use full fat or whole milk to get a tasty carrot halwa. For a low fat version just reduce the amount of milk in the recipe or use low fat milk. You can also skip or reduce the amount of ghee. If you are a vegan you can make this halwa with coconut or almond milk. Grating carrots: Grate the carrots with a hand held grater or food processor. I always use a food processor. You can grate to thick or thin shreds depending on how you like your carrot halwa to be. My kids like them to be very fine as the halwa just melts off in the mouth. But for this post I have used larger gratings. Sautéing carrots: My mom makes the carrot halwa by first sautéing the grated carrot in ghee for 5 mins. Then pouring the milk. However I do not do this just to save time. Adding ghee at a later time, once the halwa is cooked gives a more intense flavour. So you can do either ways. 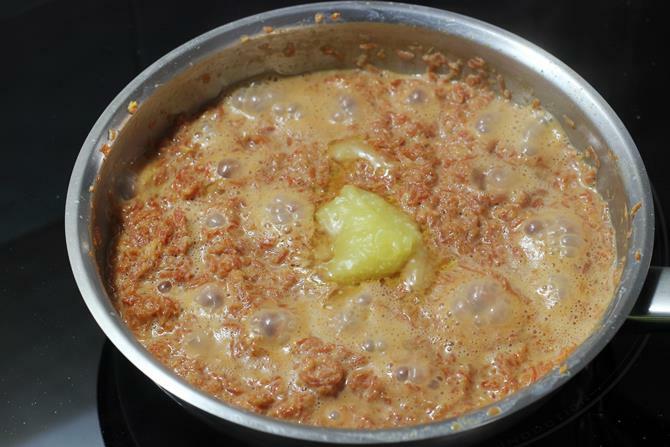 Cooking: Be cautious & do not leave the carrot halwa on the stove unattended as the milk will get scorched and burnt. 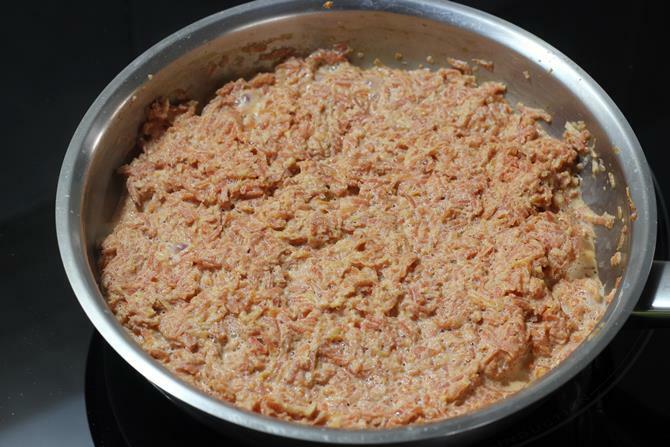 You will need to constantly stir the gajar halwa. I have been using instant pot for quite some time for all my cooking. Making carrot halwa in an instant pot is a breeze as you don’t need to stir the pudding like we do for the traditional method. Instant pot needs lesser liquids to cook the foods so I use only a cup of milk for 500 grams of carrot. Press the saute button and add 1 tbsp ghee. When it is hot fry the nuts until light golden. Then add in raisins if using. When they plump up remove to a plate. Then add in the carrots & saute for 2 to 3 mins stirring well. Pour 1 cup milk and mix well. Secure the instant pot lid. Press the pressure cook button & set the timing to 5 mins. Set the steam vent to sealing. When done, allow the pressure to release naturally for 1 to 2 mins. Then place a kitchen towel & do a manual pressure release carefully. Sir in the sugar, ghee & cardamom powder. Press the saute button & saute until the milk evaporates completely. Garnish gajar halwa with chopped nuts & raisins. Gajar halwa or carrot halwa is a classic sweet dish from Indian cuisine made with carrots, sugar and milk. It is flavored with cardamom powder. This recipe post shares 3 methods of making carrot halwa. Choose tender or young carrots that are fresh. Wash carrots under running water. Peel them and grate in a food processor or with a hand grater. You can choose to grate finer or thicker to suit your taste. Set this aside. 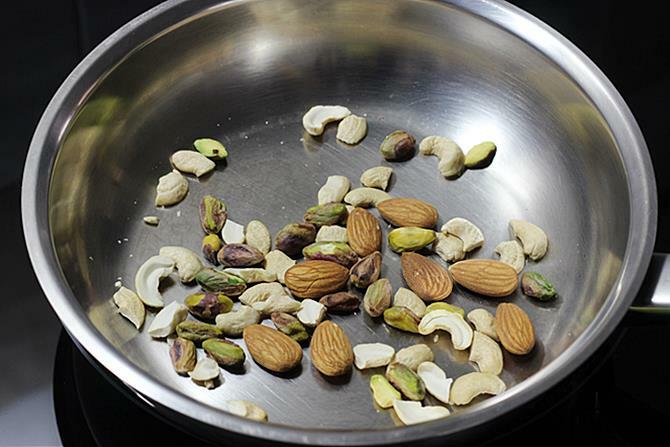 Dry roast nuts on a low heat until crunchy, cool & chop them. Or alternately chop the nuts first. Heat 1 tbsp ghee in a pan and fry the nuts until slightly golden. Then add raisins & fry until they plump up. Remove to a plate. Next bring milk to a boil in a heavy bottom pot or deep pan. Add grated carrots and begin to stir. 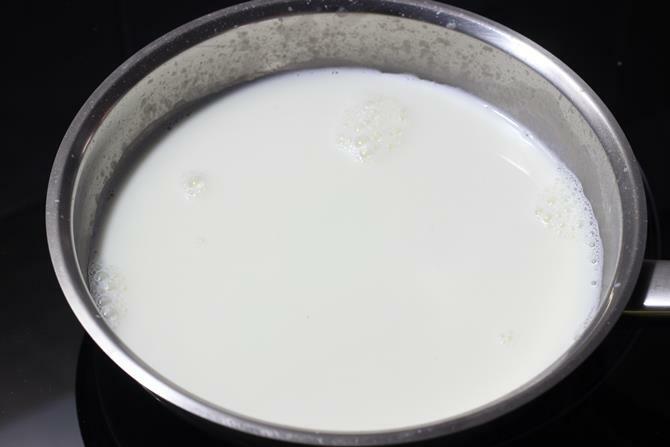 Cook on a medium heat stirring often until the milk has completely evaporated. Do not leave the pot unattended as the milk will get scorched. Add sugar and stir well. Sugar will release lot of moisture & will make the entire carrot halwa gooey. Cook until half the moisture evaporates, then stir in the ghee. Saute the carrot halwa well in ghee until the moisture evaporates completely. 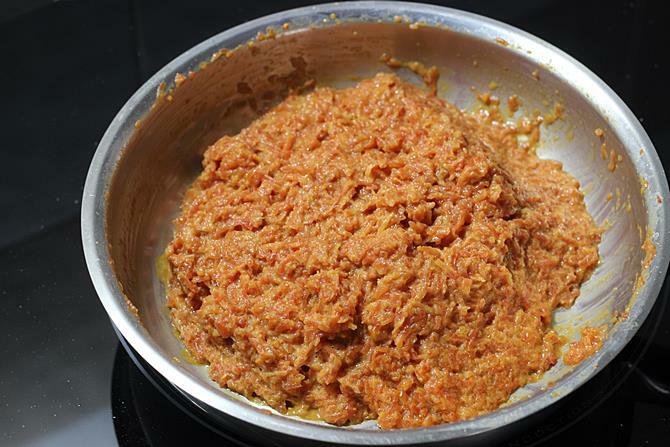 When it is done gajar halwa turns aromatic & thickens. Sprinkle the cardamom powder. If you like you can add grated khoya at this stage. Stir and cook for just 2 to 3 mins until the khoya blends well. Garnish carrot halwa with nuts. Serve Warm or chilled. 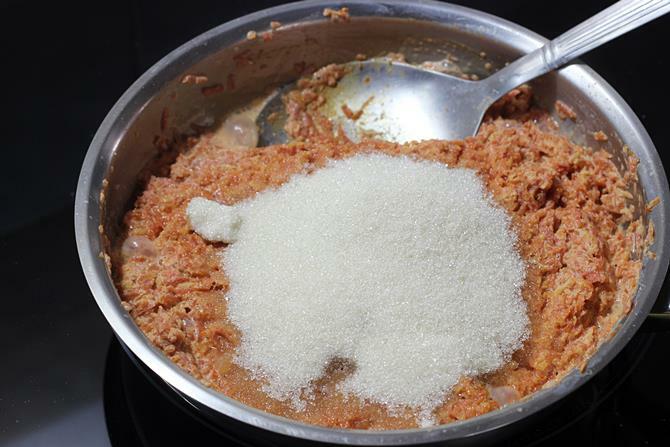 Method 2 – Gajar ka halwa using khoya. For ½ kg carrot, we will use only about 1 cup milk. Then ½ cup grated khoya or mawa. ½ cup + 2 tbsp sugar. Follow the same method mentioned above and then add khoya towards the end. Stir the carrot halwa until khoya melts. If using sweet carrots, half cup sugar will be good enough. 1. Wash carrots thoroughly under running water. Peel and grate them. A food processor quickens the process of grating. So if you own one, you can use it. 2. Make sure you use a heavy bottom large pot or pan for this recipe as it helps to prevent the halwa from sticking to the bottom and burning. However a pressure cooker too works well. On a low heat dry roast nuts until crunchy for garnishing. A few pistachios, cashews and almonds would do great. You can also fry them in ghee. But dry roasting eases the chopping work. Cool and chop them. 3. Next to the same pan, pour milk and begin to heat it. 4. Add grated carrots. Another method is to saute the carrots in ghee until a nice aroma comes out then pour milk to it. 5. Stir and cook on a medium flame. Keep stirring to prevent burning at the bottom. Since I used a heavy bottom pan, I didn’t have to stir very often. But I suggest consistently keep checking otherwise the halwa will stick at the bottom. 6. You will have be cautious always towards the end. Especially when the milk has almost evaporated. 7. Cook until the milk completely evaporates. 8. Next add sugar and stir. 9. Sugar melts and carrot halwa turns gooey once again. Stir and cook. When the moisture is half evaporated, add ghee and stir well. 10. Stir and cook until the halwa thickens. Just before you finish off, add cardamom powder. Finally garnish carrot halwa with nuts. Serve chilled or warm. Glad to know you all liked it. Yes I will try to share it. Thanks for the comment. Thanks a lot for following the recipes. Hope u n family are doing very well. I went to India. I’m back now. I tried beetroot halwa. It’s pretty simple and delicious. Can I prepare gajar the same way? Glad to see your comment after a long. Yes we are all doing good. Hope you had a good time in India. Yes you can make gajar halwa too the same way. I made the carrot halwa for a holiday brunch with my family and it was definitely a crowd pleaser. Thank you for sharing the recipe. I spent some time in India on an extended business trip and I’m excited to see so many of my favorite dishes here. Planning to try more. So glad to know you. I think you had made this last month too. So glad to know you liked it. All your recipes are so good that I try without referring any other recipe. Made this from scratch for a party along with your veg dum biryani raita masala vada and all turned out great. Thanks a lot. Who can resist to that bowl of yummy halwa. One of my favorite sweet !! lip smacking and yummy carrot halwa. love gajar ka halwa always.